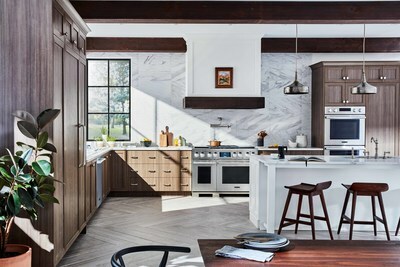 NEW YORK, March 20, 2019 /PRNewswire/ -- Signature Kitchen Suite has launched the "True Design Challenge," a groundbreaking design competition that offers 15 professional designers, architects, builders, remodelers and dealers a unique opportunity to spotlight their best kitchen designs outfitted with Signature Kitchen Suite appliances. Prizes include cash awards and all-expenses-paid trips to the True Design Awards Gala at the new Signature Kitchen Suite Experience & Design Center in Napa, Calif., totaling more than $100,000. Announcing the competition on the eve of the 2019 Architectural Digest Design Show, Signature Kitchen Suite General Manager Zach Elkin explained how today's Technicurean™ home chefs are embracing design and technology. "These are curious, passionate foodies who crave the ultimate in culinary precision and are inspired by design. Through the True Design Challenge, we're able to build a stronger dialogue with our trade community, gain inspiration and learn from the people who are on-the-ground every day, speaking with our Technicurean consumers," he said. Kitchen Design Categories – All design styles, including traditional, transitional, contemporary, modern, rustic and beyond, are welcome for submission. Kitchens must have at least one major Signature Kitchen Suite refrigeration and cooking product (range, range top, cooktop, wall oven) to be eligible for a "Best Overall Kitchen" prize. Two Signature Kitchen Suite refrigeration products are required to be eligible for a "Best Refrigeration" prize. Eligible entries will be judged based on adherence to assignment, best use of brand appliances including oerall visual appeal, creativity and strong elements and principles of design. Entries – Call for entries begins May 1, 2019 and ends January 31, 2021. Kitchen designs must be completed between January 1, 2019 and January 31, 2021. Semi-finalists will be announced in May 2021, with the winners announced in September 2021 at the Signature Kitchen Suite Awards Gala at the brand's newly opened Experience & Design Center. The first-of-its-kind facility features nearly 20-plus vignettes and serves as a brand epicenter for retailers, designers and builders, exploring the intersection between technology and culinary innovation. Semi-finalist Prizes – Semi-finalists will be chosen based on an overall score. Each of the 15 semi-finalists will be awarded $1,000 and a trip for two to the True Design Awards Gala in Napa, Calif., including airfare, accommodations and transfers. Grand Prize Awards – The highest-scoring semi-finalists in each category will be announced at the True Design Awards Gala and receive one of six cash prices. An additional $5,000 in special prizes will be awarded to the "best of the best" at the gala. For more information about the True Design Challenge, including the Official Rules, please visit SignatureKitchenSuite.com/us/true-design-challenge. Founded on the philosophy that better cooking is possible through better thinking, Signature Kitchen Suite is the fresh new luxury brand of built-in kitchen appliances that delivers innovation, performance and versatility to today's home chefs. The fastest-growing luxury kitchen appliance brand, Signature Kitchen Suite continues to garner critical acclaim, most recently at the 2019 Kitchen & Bath Industry Show where the brand captured the highly coveted "Best of KBIS" Gold Award for its industry-first pro range with built-in sous vide modality, as well as the National Kitchen and Bath Association's inaugural "30s Choice Award" for its new integrated wine column refrigerator series. Rules and restrictions apply. NO PURCHASE OR PAYMENT NECESSARY TO ENTER OR WIN. Eligible kitchen designs must be completed between January 1, 2019 and January 31, 2021. Open to legal residents of the 50 U.S. and D.C., who are professional designers, architects, builders, remodelers and kitchen dealers (i.e., persons who are paid for residential kitchen design services) and are 18 years of age or older at the time of entry. There is no limit to the number of entries; however, a designer, team or firm is eligible for only one finalist prize and one grand prize. Void where prohibited. For more details and complete Official Rules, go to signaturekitchensuite.com/us/designers. Signature Kitchen Suite delivers innovation in the luxury built-in kitchen appliance market with leading-edge technology that provides more flexibility to prepare food in the best possible way, demonstrating respect for the food at every level. The new luxury brand from global home appliance leader LG Electronics, Signature Kitchen Suite is embracing a new generation of forward-thinking Technicurean™ cooks, combining their passion for food with their appreciation for innovation. From the first-of-its-kind built-in sous vide range to the industry's only built-in French Door refrigerator with a convertible middle drawer, Signature Kitchen Suite's versatile and high-performance appliances deliver the ultimate precision cooking experience. Visit www.signaturekitchensuite.com or follow the brand on social channels @SKSappliances.